Everyone has a favorite go-to workout routine to keep fit. Do you prefer to spin, participate in CrossFit, head to the gym and figure your own routine or, perhaps, an all-body circuit class? There is no shortage of options, but sometimes too many options can get confusing and it’s good to get some guidance based on your goals. One solution is your own personal trainer, in the form of your smartphone. Luckily you can take your smartphone anywhere (often including the gym), meaning there’s no reason why you can’t have a program downloaded to an app. 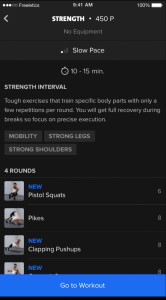 Freeletics is one of the better training apps, combing an online and in-app solution which delivers a full range of training options and easy-to-follow fitness programs to get you in shape. Freeletics can be an alternative to a crowded gym, expensive trainers and full classes by enabling you to train at home or the local park. Freeletics is not short of options, either, including dozens of workouts, which all are named after Greek gods as they are intended to transform your body into one! Workouts solely rely on bodyweight moves and utilize high-intensity interval training (HIIT) to get you in shape. You can expect to be doing burpees, bodyweight squats, pull-ups, sprints and press ups as part of the routines you will find on the app. Download Freeletics for iOS and Android.